My son Jerrod is in Israel for one more week with a group of upcoming high school seniors. I sent my daughter off to Memphis on a Greyhound yesterday to spend a long weekend with some of her camp friends and my parents. A week from Sunday, I take my kids to Paris, France, my birth place, for two weeks. We’ll see relatives they’ve never met, visit the sites, eat great food and take a cooking class. Shortly after we return, Jordyn hits a leadership camp for a week, and then my kids are back to school. 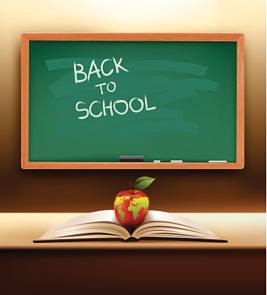 Now, back to school means increased sales for retailers and smart niche marketers. Each year the week before school starts back, teachers report for duty. They spend that week “in service” fixing up their classrooms and attending meetings and training sessions. Most of the schools will cater in a variety of breakfasts, lunches and snacks for their teachers. Very few restaurants will proactively market to schools to grab their share of this catering niche. The letter uses a back to school banner, available from Oriental Trading, as a grabber. We have over 500 ad templates on our site you could re-write to go after this niche. #1. Mail the niche, when the niche has a definite need (schools will be catering in for teachers in service). #2. Follow up with a phone call a week or so after the mailer hits. Telephone follow up increases results by 300%. RCS is working on a campaign generator to send out letters or postcards for niche targeting like this, then creating a list of people to call at the right time and recording those outbound calls. That way you, as the restaurant owner can verify the calls were made and how effectively they were made. A piece of creative mail “softens the beach head” for you to call. “Principal Jones. This is Michael Attias. I’m the guy who sent you the back to school banner. Did you get it? Now things are warmed up to talk. My plans are to blog from Paris and share insights our restaurant and catering community can benefit from. You never know where that next great idea will come from. As they say in France, “Jusqu’a la prochaine fois” (until next time).